Lightning Lookout is the thirty-third level in Donkey Kong Country 3: Dixie Kong's Double Trouble! It is also the third area of KAOS Kore. In the game's Game Boy Advance remake, the level is instead the thirty-ninth level, though still the third area of the world. This is the last riverside level. Lightning shoots down at the ground, damaging the Kongs if hit. A warning flash will appear above the spot where the lightning will hit. If the Kongs are in the water and lighting strikes it, they will get electrocuted. The lightning can also defeat enemies. The level contains Buzzes, yellow Knik-Knaks, and Booty Birds. A few red Knik-Knaks and a Nibbla also appear in one of the level's Bonus Areas, although Nibbla only appears in the Game Boy Advance version. Red Buzzes and Koin are immune to the lightning strikes. When the Kongs begin the level, they walk down a dirt pathway and move under some Buzzes, avoiding lightning strikes. Soon, they meet several flightless yellow Knik-Kniks. Defeating these enemies and hopping over small gaps, they cross a small lake to find the letter K. Continuing on, they pass more Buzzes, Knik-Knaks, and lightning strikes until they find a wall of Buzzes. With the help of the lightning, they are able the defeat these enemies and head on. Soon, they cross some gaps and grab the letter O, passing over another lake with the help of barrels bobbing out of the water. After walking down a long pathway and avoiding more enemies, including Booty Birds, they find the Star Barrel near a ledge. About halfway into the level, the Kongs walk down more of the pathway and defeat another pair of Buzzes blocking their way. Farther on, they find the letter N between two Buzzes, and then make their way into the a pool of water to get under some red Buzzes. The monkeys get through more of the level by passing some Knik-Knaks on raised platforms. Moving under some more Buzzes, they eventually use more barrels to cross a small body of water. On the other side of the water, they go under a few Buzzes to progress and find the letter G. Moving on, the group cross another large lake with bobbing barrels, and then leap over a small gap to meet two more Buzzes. They need to hop between these enemies to continue, where they run down a long pathway and meet another pair of Buzzes. Once they get between these foes, they find a flagpole. After raising the flag on it, the level ends. Under the letter O, the heroes see a small pool of water. If they jump into it and hover to the bottom of the area, they land in a Bonus Barrel. It takes them to a Bonus Level, where they need to hop on several Knik-Knaks to cross a small pond, occupied by a Nibbla. If they beat all the insects safely, they find a Bonus Coin nearby. Around the end of the level, the Kongs cross a body of water with some bobbing barrels. Above them Bonus Barrel can be seen. Using their Team-up move, one of the Kongs should throw the other into the barrel. It transports both heroes into a Bonus Level. There, they have to collect many green bananas around the area, while avoiding constant lightning strikes. After they safely collect all the bananas, they find a Bonus Coin at the other side of the stage. After the Kongs spot the second Booty Bird, they should stand under it and wait for a lightning strike. The lightning strikes the bird, causing it to drop a Steel Keg. Picking up the keg, the monkeys have to head down the path to a Koin, who has the DK Coin. Though Koin's shield protects him from most attacks, the Kongs can throw the Steel Keg over him to make it bounce off of a nearby wall, hitting Koin's back and making him drop the DK Coin. There is a longer break in between lightning strikes (roughly 4 seconds as opposed to the SNES version's 2 seconds). The level is brighter and no flash occurs when lightning strikes on-screen. Also, the background is pitch black, except in the first Bonus level. 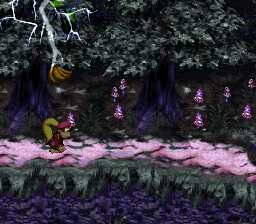 In the SNES version, the Kongs' skeleton can be seen briefly when they are struck by lightning; in the Game Boy Advance version, this only occurs if they are hit while underwater. The red Buzz guarding the second Booty Bird is now green, making it easier to get the Steel Keg needed to defeat Koin. The first Bonus area is smaller, and the player must defeat 6 Knik-Knaks instead of 7. This level is the farthest from the last level of the same type, Bobbing Barrel Brawl, which is only on the second world. If Dixie is the only Kong onscreen and is hit by lightning, the life icon will flash as well. This page was last edited on April 10, 2019, at 13:52.